Twitter is a micro blogging and online social networking service which holds approximately 500 million active users this year alone. For those that love statistics those 500 million users are creating over 340 millions tweets a day! For those cautious of Twitter – look at it like SMS. You have 140 characters to use per tweet, keep your updates short, simple and to the point. You can even add images, links and location to your messages. Twitter has many benefits for a company. It allows you to expand your network – this can allow you to reach new customers, check out your competitors, and reconnect with previous customers. The possibilities are endless. For such small messages they provide such rich content, they allow you to listen and engage with your target market, which as a result creates brand loyalty. 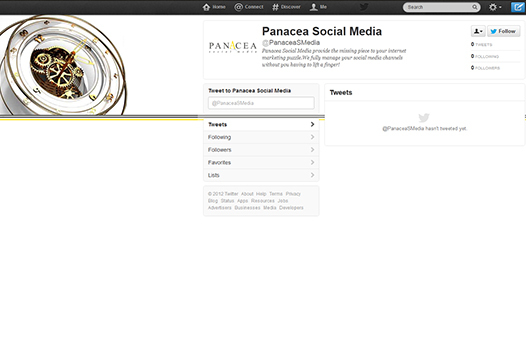 At Panacea Social Media we aim to continually listen and engage with your target market. Monitoring and keeping you informed of the progress every step of the way is key. We manage the updates, analysis, monitoring and implementation of all the Twitter activity so you don’t have to worry. We will then measure on a monthly basis the amount of followers the company or business has gained, and the level of engagement that has occurred over that time period.